Chelone is an excellent hardy border perennial with medium deep-green, boldly veined leaves. 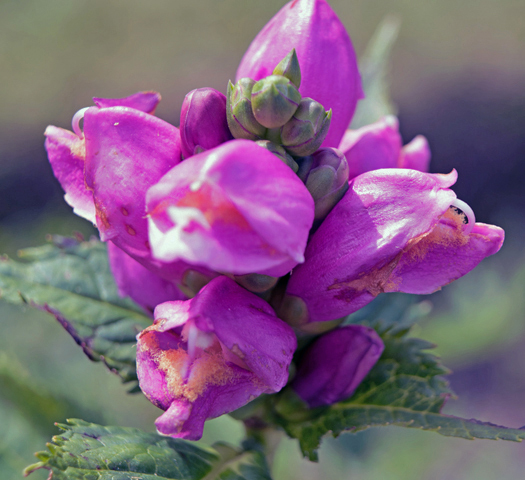 The weather-resistant 'snapdragon' like flowers are dark pink or purple, borne in short, dense, terminal spikes. The blooms open in late summer and will last for around four weeks, particularly if they are deadheaded and not allowed to run to seed. They can be grown more or less anywhere provided the soil is always moist, thus making them suitable for the edge of a 'bog' garden. Prick out seedlings if large enough to handle 70mm (3") pots and grow on in a coldframe. It can take up to two years before the seedlings are up to being placed in their final quarters. During this period ensure that they do not dry out or become pot bound. An occasional half strength general liquid feed can be given throughout the summer months. for their first year then pot them up into suitable sized pots and grow them on in the coldframe for another year. They are generally disease free but can occasionally be affected by powdery mildew, particularly if grown in confined spaces.